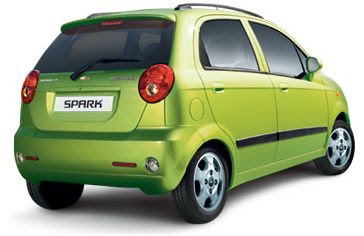 The Chevrolet Spark has got rid of the three cylinder engine of the old Matiz - and in its place is a new 995 cc four cylinder engine that produces more power than the newly released Fiat Palio Stile 1.1. You get 62.13 bhp (48.5 KW) at 5400 rpm, and 9.02 kgm (90.3 NM) of torque at 4200 rpm which are very decent for a car in this class. The five speed manual gearbox is quite capable and well-sorted out, and most auto mags have said that the Spark drives well, and the car feels sure-footed for something this small.